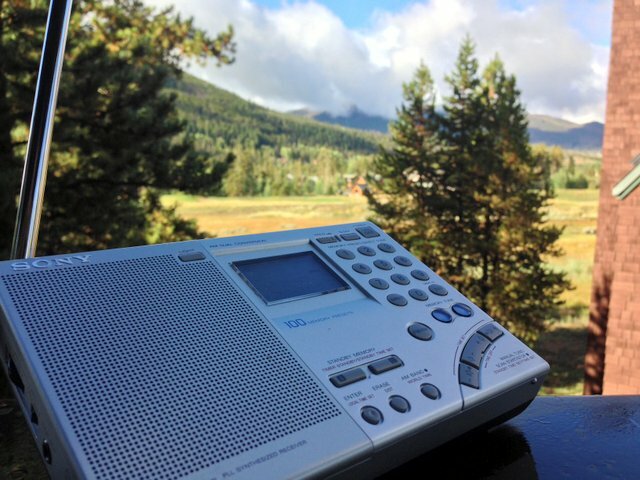 I’m in Keystone, Colorado at about 9,300′ (2,835 M) above sea level; mornings are crisp and chilly (38F/3C), but that doesn’t stop me from putting on a jacket, heading to the balcony and listening to Radio Australia on 9,580 kHz. Despite flaky solar conditions (flaky, frankly, is an understatement) I managed to snag RA Wednesday morning (13:58 UTC) on my Sony ICF-SW7600GR. There was a little fading, and a little local noise, but overall signal quality was quite good. This recording starts a couple of minutes before the top of the hour; you’ll hear the TOTH news brief and then triple j—a brilliant show dedicated to new Australian music. This entry was posted in Broadcasters, Music, News, Recordings, Travel, What's On Shortwave and tagged ABC, Australian Broadcasting Corporation, RA, Radio Australia, Recordings, Shortwave Travel, Sony ICF-SW7600GR, Travel, triple j on August 31, 2014 by Thomas. Reception Conditions: Within my apartment here in Bristol, Connecticut, USA. I was getting a little wavy disturbances at times but it was still reasonably listenable. Running Tripple J is an excellent idea. Running news and current affairs overnight really makes no sense. And indeed Triple J is very good too. I discovered some nice music from talented people I’ve never heard about in my part of the world. Just a comment, Triple-J is actually one of several government radio networks with stations situated across Australia. Radio Australia have been relaying Triple-J programming recently and there is some local speculation that budget cuts to Radio Australia have forced them to share programming with other Australian Broadcasting Commission networks. None of the above should be taken as a comment derogatory to Radio Australia or Triple-J both of whom I enjoy listening to but rather as an observation on the reduced funding levels that many shortwave broadcasters are having to work around. Great recording! As usual, Sony ICF-SW7600GR does a really good job coping with signal fading. Nice music too!